When I first saw Lalor’s red text in the Irish Times I have to admit I did not get it. Nor did I get it when I actually tried to read the red text itself. I was intrigued. Yes. I was impressed by the daring of the author. But I didn’t know what in the world it meant. But was it meant to mean? And can we really look for an author here? Is Lalor not rather playing the clown, the joker in the pack, what Levi-Strauss calls the bricoleur. Is he not playing the role of anti-author or posthumous author in the sense proposed by Roland Barthes in his landmark essay ‘The Death of the Author’? For Lalor’s red strips of text – might we call them strip-tease texts? – lure and frustrate us at the same time. The scarlet invites us to look, regard, take note, scrutinise, then fades into black. It beckons to the reader only to retreat into an incomprehensible night of tiny illegible writing surrounded by the very legible print of the newspaper itself. The Irish Times meets Scarlet and Black. Madame de Rênal plays hide and seek with Sorel the reader. The paper seems to bleed, as if sense was hemorrhaging into non-sense. But this only heightens the whole question of what ‘is’ sense in the first place, what makes sense? In what sense should we and do we read newspapers when they are presented to us as ‘news’, ‘reportage’, ‘narratives’, ‘the facts’? All different genres and styles. Yet we normally take them for granted, precisely as given. A quick read over breakfast or lunch, in the bus, train, plane. Writing as information first, connotation second. But there is also a ‘Third Meaning’, as Barthes points out in his essay of that name. And that is the meaning that Lalor is trying to make sense of by making non-sense of it all. A ‘slippery trickster’ who learns from Finnegans Wake and Lewis Carroll that there is a nocturnal unconscious at work in the play of words within words. Or maybe Lalor echoes Yeats’ motto, ‘words alone are certain good’. Whatever it be, this is ‘writerly’ writing as described by Barthes: ‘writing is the destruction of every voice, of every point of origin….it is that neutral, composite, oblique space where our subject slips away, the negative where all identity is lost, starting with the very identity of the body writing’ (The Death of the Author). This can provoke a certain ludic jouissance, he says, where words become obtuse, impertinent, perverse, impenetrable: a text to be ‘disentangled rather than deciphered’ – ‘run like the thread of a stocking at every point…. But there is nothing beneath: the space of writing is to be ranged over, not pierced; writing ceaselessly posits meaning ceaselessly to evaporate it, carrying out a systematic exemption of meaning. In precisely this way writing…by refusing to assign a ‘secret’, an ultimate meaning, to the text, liberates an activity that is truly revolutionary’. Why? ‘Because to refuse to fix meaning is to refuse God and his hypothases – reason, science, law’. In this sense, we can say that Lalor’s non-sense is irrational, anti-scientific and illegal, in the most revolutionary sense of the term. Lalor the outlaw, the subversive, the Nietzschean, Dionysian anti-Christ. Celebrant of what certain postmoderns have called an ‘erotics of reading’ (as opposed to a hermeneutics of interpretation). A young artist taking his cue from that other Dublin Parisian, Beckett, when he says, ‘no symbols where none intended’. That’s John Lalor for you. And if you were to take all the little discarded, disseminated red strips together and piece them into a plot or pattern you would not get a Little Red Book (Maoist or Jungian). You would get a higgledy-piggledy pile of little scarlet scatterings without beginning or end. Parody of multiple palimpsests – Joyce, Godard and more – but no single book and no single message. As I look at one (or several ) of Lalor’s text-strips – often placed over comic strips – I cannot but recall Barthes’ provocative description of what he terms the ‘traumatic quality’ of a certain postmodern writing which blocks meaning and belongs to ‘the family of pun, buffoonery, useless expenditure. Indifferent to moral or aesthetic categories (the trivial, the futile, the false, the pastiche), it is on the side of the carnival’. Lalor rivals Magritte’s ‘This is not a Pipe’ with ‘This is not a Text’. And yet none of this carnivalesque non-sense would mean anything unless it was placed precisely in the context of a national newspaper that serves truth, seriousness, reason and law. That promises to report the facts as they are – in black and white. Not red. To see red is to be mad. To go out of your mind. As I am sure many Irish times readers did as they watched the morning newspaper menstruate into their breakfast tea. Yet many too must have asked: what does this mean? And if they did ask that question the play with non-meaning was worth it – ultimately vindicating the wager the Irish Times took in letting an exiled Dubliner creep back between the sheets of their paper and infiltrate the national body politic with viral veerings of color and word. We should applaud their brave gesture to allow the Trojan horse into the city, come what may. But there is sense to the non-sense in another way too. When I heard John Lalor tell me that when he was a child he would wonder why his father was more interested in reading the comic strip of the Irish Times than in talking to him, a light went on. The fact that Lalor’s red text ran riot over the Irish Times comic strip was telling. That piece of biography mattered a lot to my appreciation of the work and I regretted that there was not an interview with Lalor printed in the Irish Times to coincide with his experiment. Lalor is a conceptual artist (or anti-artist) after all. So concepts matter, narratives count, his images are, as Deleuze put it, des images pensantes. They are meant to make you think. And there is much thinking to be done about the relationship between the death of the author and its simultaneous rebirth. In short, I think Lalor the author is ultimately as important as Lalor the post-author. Barthes gets it half right. But only half. The other half is captured by Joyce when he said, ‘It’s a brave man would invent something that never happened’. The Irish Times experiment originated not last year but forty years ago when Lalor the son watched Lalor the father read the Irish Times comic strip when he came home from work. ‘It’s the father and son idea’, as we are told in the opening chapter of Ulysses. Which is perhaps why that is Lalor’s favorite book and why Shane is his favorite movie. The artist is dead, long live the artist. Richard Kearney holds the Charles B. Seelig Chair of Philosophy at Boston College and has served as a Visiting Professor at University College Dublin, the University of Paris (Sorbonne) and the University of Nice. He was formerly a member of the Arts Council of Ireland, the Higher Education Authority of Ireland and chairman of the Irish School of Film at University College Dublin. As a public intellectual in Ireland, he was involved in drafting a number of proposals for a Northern Irish peace agreement (1983, 1993, 1995). He has presented five series on culture and philosophy for Irish and/or British television and broadcast extensively on the European media. Richard Kearney is international director of the Guestbook Project–Hosting the Stranger: Between Hostility and Hospitality. 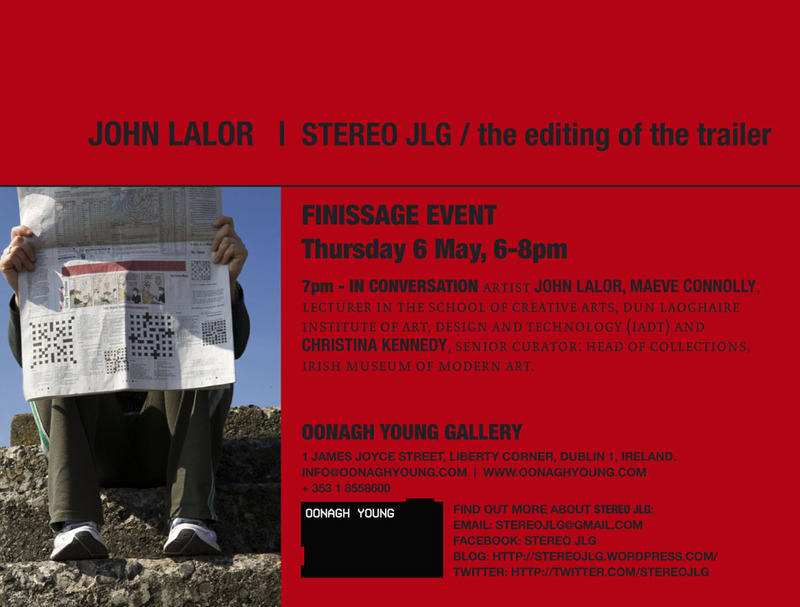 John’s work, and way of speaking about it, seemed to me such an intense textual and verbal expression of Godard’s highly idiosyncratic use of montage it set me thinking in Lisbon about why I felt his Stereo JLG project, presented in this latest stage within the pages of The Irish Times, seemed so timely and significant. I even became convinced that the Volcanic ash cloud which had threatened to prevent me from flying, and which had delayed my return, had a part to play in this conceptual matrix. Deleuze’s writing on the ‘Fold’ in Leibniz in which he describes how thoughts grow from the middle, where everything ‘unfolds’, works so well with his understanding of Godard’s force as a director; Godard’s use of the conjunction ‘and’, an ‘and’ which allows diversity, the destabilization of subjectivity and a radical state of ‘in betweenness’….AND…Lalor’s work aims to capture something of both. Montage (often described as cinema’s secret weapon) is for Godard essentially rhythmic; film for him being “closer to music”, and yet he also describes montage as being architectural and sculptural. His use of speech, repetition and stillness, whilst drawing on an astonishing variety of sources: painting, music, photography, literary and philosophical texts, give rhythm and movement an extraordinarily complex central role in his films. Godard incorporates language in a unique way into his system of montage, inserting texts and corrections freely within the work contributing towards that Bergsonian sense of past, present and future folding back on each other in a kind of continuous flux and allowing for a profound exploration of memory, both historical and personal. Although Godard said “Texts are death, Images are Life”, his passion for text is relentless and romantic. Even as I find myself stranded outside Lisbon waiting for my Leibnizian cloud to shift again, Godard’s latest opus Film Socialisme premiered at Cannes, filled with extracts from Heidegger, Beckett, Benjamin, Derrida, and even a woman at a petrol station who refuses to talk to anyone who uses the verb ‘to be’ (echoing explicitly Deleuze’s writing on his work). Lalor’s response to Godard (specifically his exhibition Voyages en Utopie at the Pompidou centre in 2006) in his text-based art works, takes up this challenge of rhythm mediated through language, pulsing along, breaking off, refusing to contain itself rationally or through punctuation. Deleuze once said in an interview about Godard that he had developed the art of “stammering in language itself”. He went on to say it was easy to be a foreigner in another language, but to be a foreigner in one’s own language is a ‘creative stammering’ which gives Godard his power. I can’t help feeling that there is a resonance here with Lalor–the Irish artist living in Paris for 20 years, caught between two languages and seemingly having developed his own system of conjunctions with which to express himself, and this Godardian ‘stammer’ (or rhizomatic mode of speech in his case), led to Lalor’s fascination with Godard’s work. 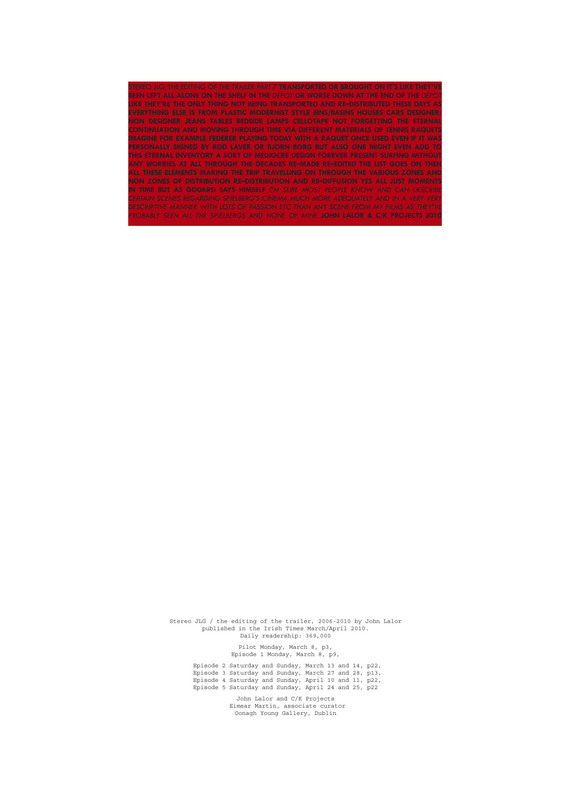 The context of Lalor’s Stereo JLG project–artistically produced blocks of text, black on red, in a daily newspaper is also important in that the temporality of the newspaper remains unique against the tyranny of digital ‘real time’. ‘Today’s news today’—the print medium’s claim for up-to-dateness appears positively sloth-like in our age of second-by-second twitter updates. The rhythm of Lalor’s text draws us in and creates a frisson against the highly codified temporality of the newspaper, making us think about how the newspaper ‘fixes’ time within a tradition now being dematerialized. Lalor’s interest in Baudrillard and Virilio provide a framework for this strategy; how those theorists highlight the transformation in our experience of time brought about through ‘real time’ news media, especially after the Gulf war (a dematerialization which notoriously led to the misinterpretation of Baudrillard’s statement ‘The Gulf war did not take place’). ‘Real Time’ rejects freedom of interpretation in that it happens too fast, and tends to lead to a passification of the viewer, and printed text today struggles to maintain itself against its electronic rival. The ‘crisis of truth’ and battle for authorial supremacy one finds in the print media at a time when truth itself is a fractured ideal, finds a correlation in Deleuze’s writing on ‘incompossibility’ in Leibniz; worlds or narratives which diverge yet co-exist, where completely different stories unfold simultaneously, difference and similarity pushing against each other, as in a Godard film, and also within Lalor’s texts, and in the relation they have to their context. We live in a world of “co-existing incommensurables”. Foucault wrote of aspiring towards an ‘anonymous murmur’, an anonymity of discourse which allowed de-subjectification to take place; he called it a ‘déprise de soi’ (a withdrawal from oneself), a freeing of oneself from memory and habit and identification, and Lalor seems to push his text towards this ‘fourth person singular’, away from any single, regulating, editorializing ‘self’. This again plays in an interesting way against the norms of newspaper reportage, that pull between ‘objectivity’ and the ‘Charlie Bird’ syndrome of faux heroic journalism; Lalor is commenting but we can’t pin him down–there is no central speaking subject, no identifiable place or tense. You had to make an effort to find Lalor’s pieces within the broadsheet and this too was an important part of his strategy, and resembles the cryptic approach of Godard’s montage. It also made one aware of how one peruses a newspaper, what one finds by accident scanning its pages as opposed to the highly manipulated presentation of cyber-information. Leibniz’s fold was a “dance of particles folding back on themselves” and Lalor’s rhythmic compositions seem to fold and flow like particles, but also like the complex movement in a Godard film, striving to maintain that ‘in betweenness’ which fosters artistic creativity. A number of years ago Hans Ulrich Obrist discussed with Paul Virilio the problem of the ‘industrialization of perception’, and how one can resist artistically this process, and Godard’s latest film is yet again his line drawn in the battleground. It seems incredibly appropriate that John Lalor’s work takes up this artistic challenge in the month preceding the general release of Film Socialisme. Despite the frustrations felt by many, that Ash cloud gave me a secret pleasure in its ability to destabilize capitalism so effectively through its unpredictable movement—like the rhythm of great music, or artistic composition, some things remind us of the importance of the ‘incompossible’. Katherine Waugh is a writer and filmmaker who recently co-directed the documentary ‘The Art of Time’.